1.Bake pastry shell as label directs; cool. 2.Prepare Chocolate Mousse: Place chocolate chips and salt in medium bowl. In small saucepot, heat 1/3 cup cream to a simmer over medium heat; pour over chocolate and let stand 1 minute. Whisk until smooth; stir in peppermint extract and cool. 3.In large bowl, beat remaining 3/4 cup cream and sugar on low speed 1 minute. Increase speed to medium-high; beat 5 minutes longer or until stiff peaks form. With rubber spatula, gently fold cream mixture then candies into chocolate mixture; evenly spoon into pastry shell and refrigerate. 4.Prepare Whipped Cream: In medium bowl, beat cream, sugar, sour cream and vanilla extract on low speed 1 minute. Increase speed to medium-high; beat 5 minutes longer or until stiff peaks form. With rubber spatula, gently fold in candies; evenly spread over Chocolate Mousse layer. Loosely cover with plastic wrap; refrigerate 6 hours or overnight. 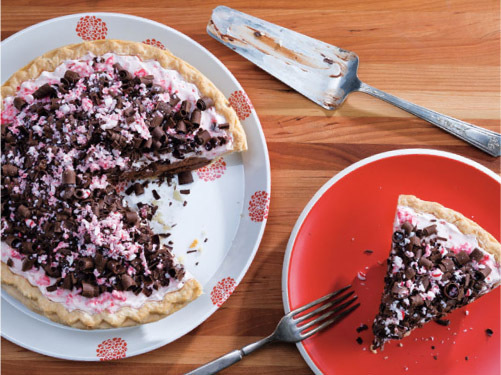 5.Sprinkle pie with chocolate shavings and candies just before serving; cut into 8 slices and garnish each slice with a candy cane, if desired.